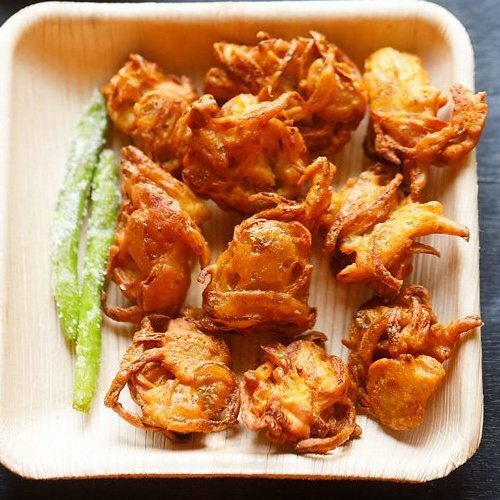 crisp onion pakora or onion fritters made with gram flour or besan batter. 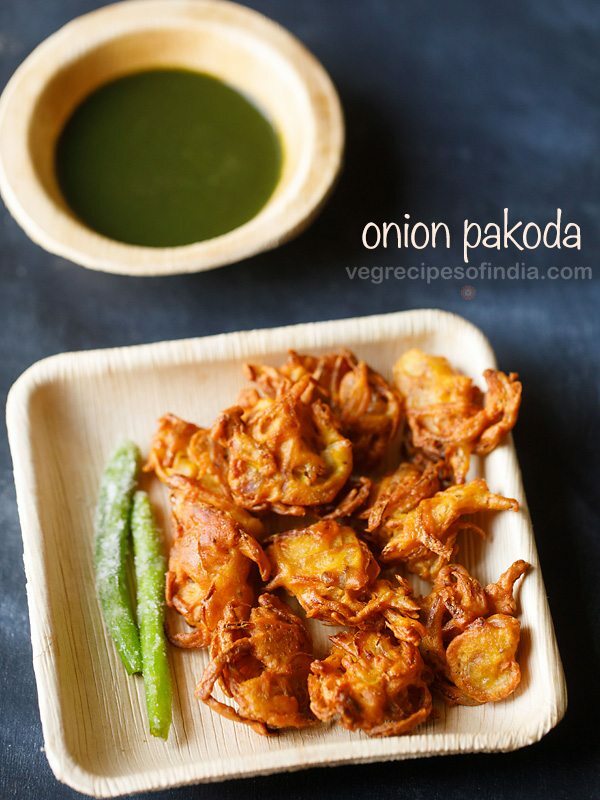 onion pakoda recipe with step by step photos and video – onion fritters made with gram flour (besan) are a popular and yummy indian street food. it is one snack that is easy to prepare and tastes good too. 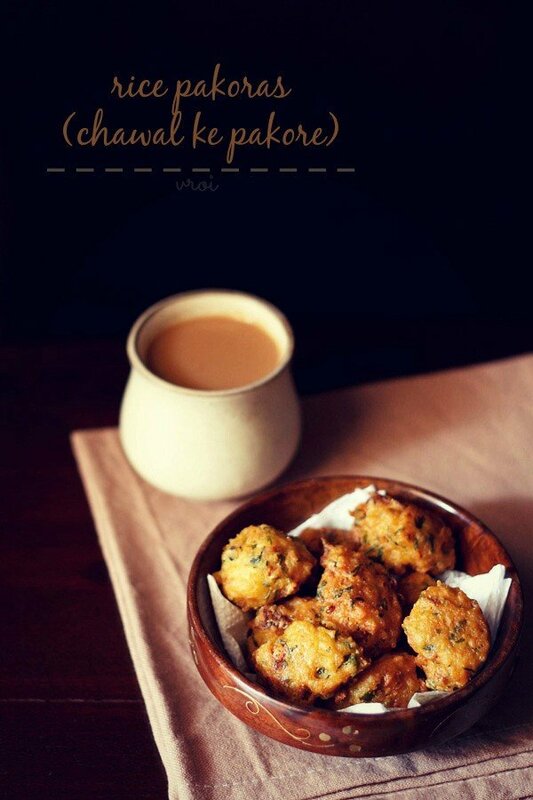 onion pakoda are very much in demand during rainy season or during winters, as their combo with hot ginger tea tastes too good. 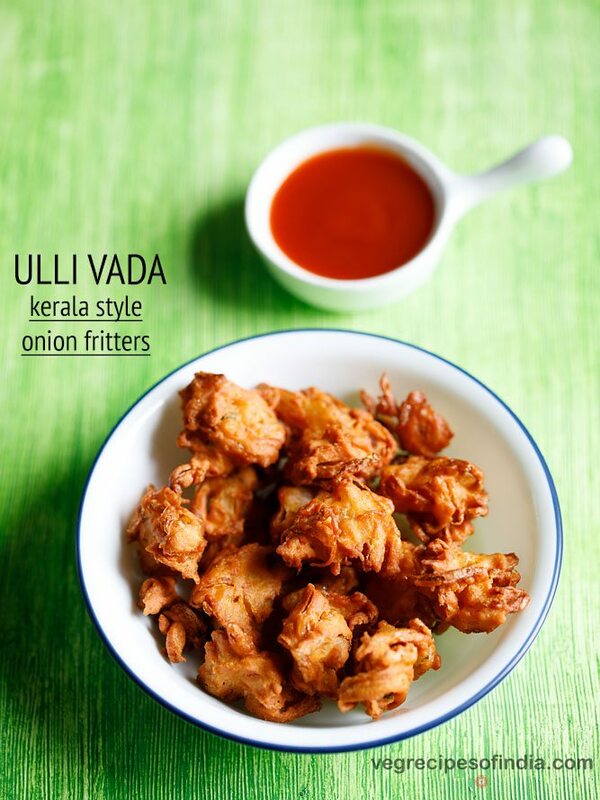 onion pakoda are usually served with some fried salted green chilies and a green chutney or sweet chutney. this whole combo is also served with the indian chai. 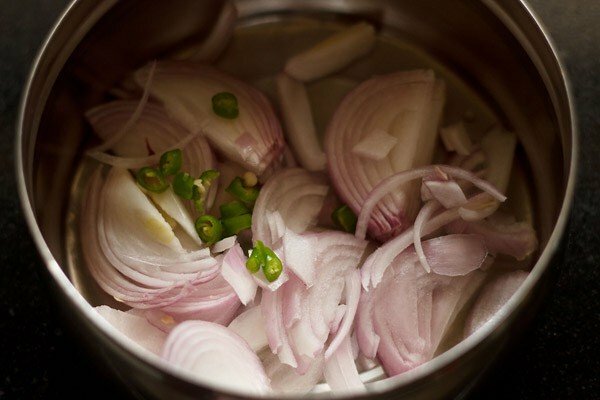 the onions have to be sliced thinly and not thickly as thin slices will get cooked faster than thick slices. if the slices are thick, then while frying the chick pea flour or besan gets cooked but the onion slices remain half cooked. some cooks use a pinch of baking soda in the batter to add that extra fluffiness to the onion pakora. i don’t like the taste and flavor of baking soda, so i have not used it. in the batter, you can also add 1 or 2 teaspoons of oil. this makes the onion pakoda crisp and it absorbs less oil while frying. the temperature of the oil has to be correct while frying. 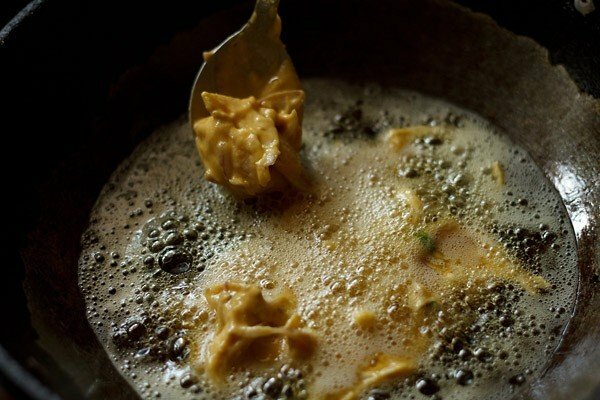 the oil should not be too hot or cold. if it is hot, then the outside of the onion pakoda will get fried but the inside will be under cooked. 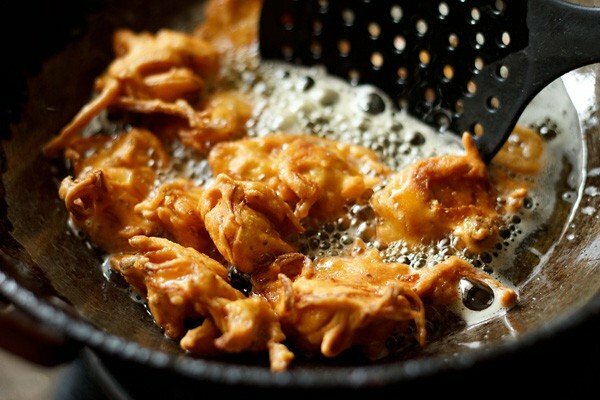 if it is not hot, then the onion pakoda will absorb oil while frying and will be too oil-laden once fried. you can also bake the onion pakoda. 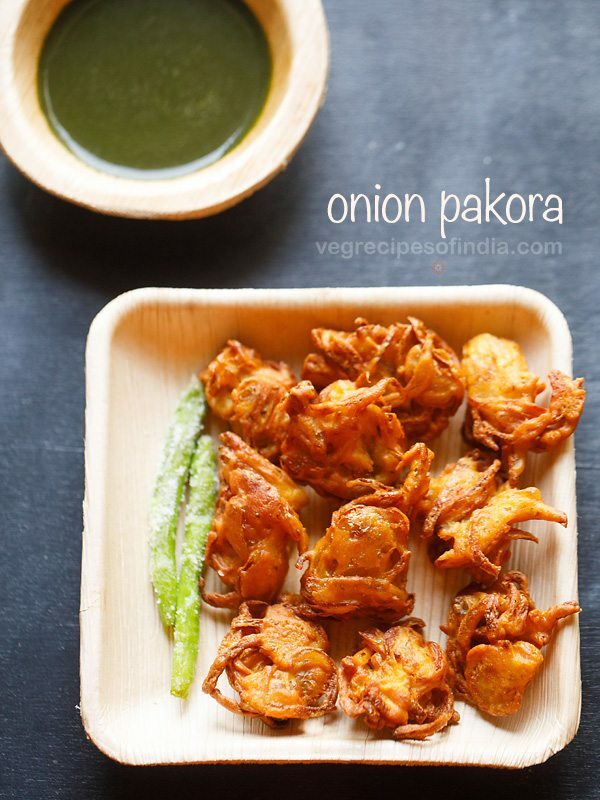 baked onion pakora will taste differently than fried ones. the baked onion pakoda won’t be as crisp as the fried ones. if you want to have a fried version, then just best to make that and enjoy the hot onion pakoda with a steaming cup of indian chai. the onion pakora also tastes good with bread and can be sandwiched between bread slices and some chutneys. 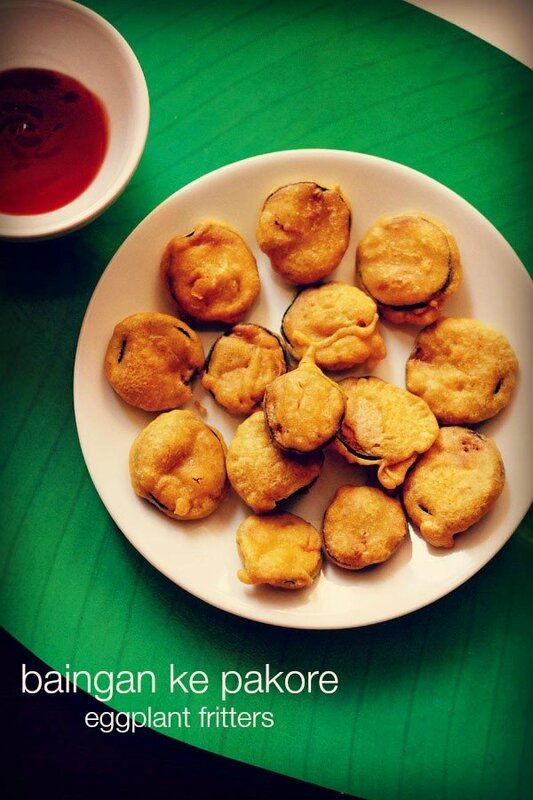 palak pakoda – crisp and tasty deep fried spinach fritters. potato bajji – crisp potato fritters. paneer pakoda – gram flour coated cottage cheese fritters. mirchi bajji – tangy, spiced, crunchy and tasty stuffed chilli fritters. slice the onions thinly and take them in a mixing bowl. also add chopped green chilies. if you do not have green chilies, then add red chili powder. you can also add chopped coriander leaves, if you want. add the spices - carom seeds, turmeric powder, asafoetida and salt. mix everything well. cover and keep the onion, chilies and spice mixture aside for 15 to 20 minutes. the onions would release water and then you can add water as required in the batter. 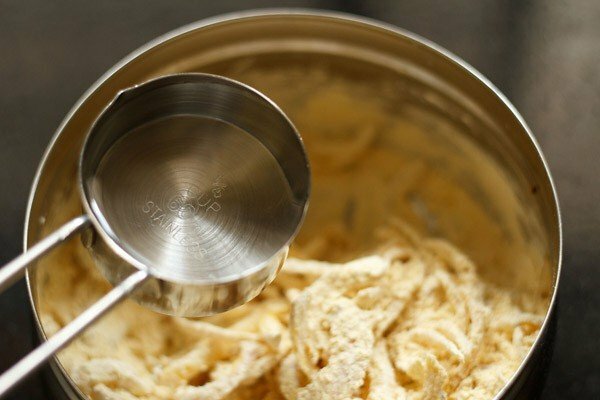 add required amount of water to make medium thick batter. stir the whole mixture very well with a spoon or with your hands. the onion pakora batter is ready to be fried. 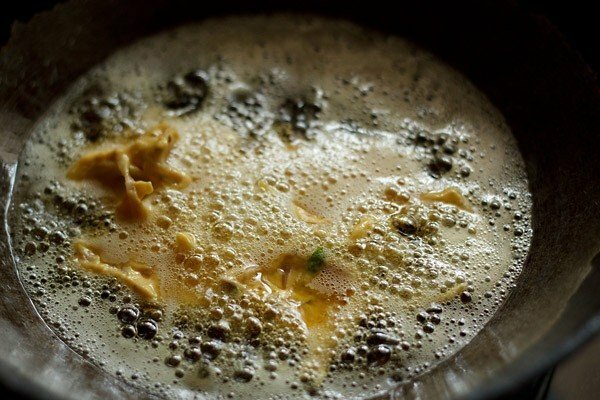 in hot oil, add spoonfuls of the batter. depending on the size of the kadai or pan, you can add less or more. just make sure you don't over crowd the onion pakoda while frying. when the pakora are a bit cooked, turn over with a slotted spoon and continue to fry. you will have to turn the onion pakora few times for even frying. 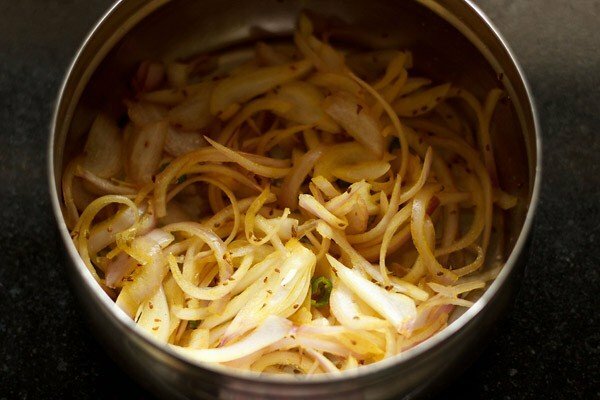 fry the onion pakora, till they look crisp and golden. remove them with a slotted spoon. 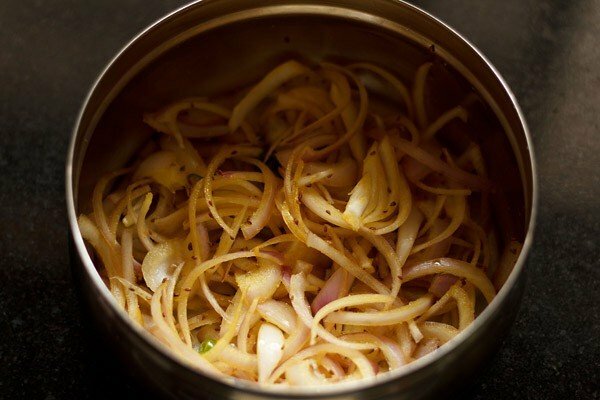 drain onion pakoda on kitchen paper towels for excess oil to be absorbed. in the same oil fry slit green chilies. sprinkle some salt on the green chilies and mix well. 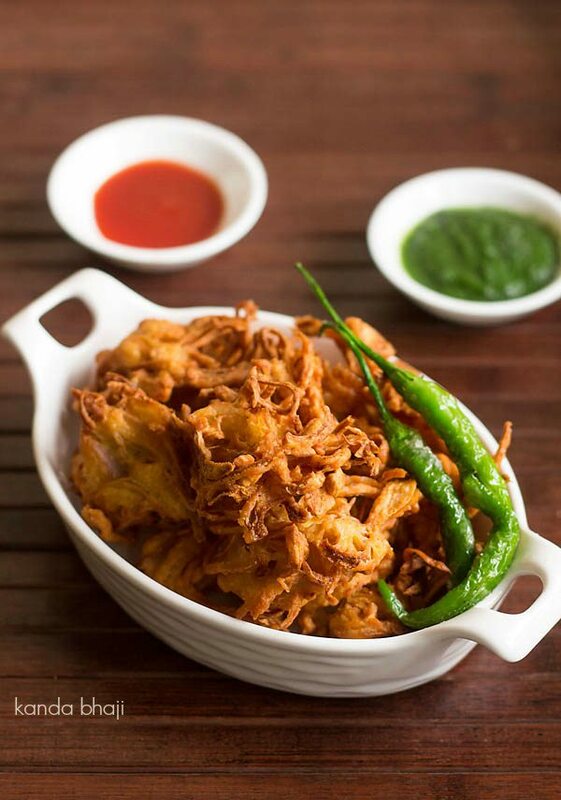 serve onion pakoda with the fried green chilies or coriander chutney or tomato sauce. you can also bake them but the taste will be different than the fried onion pakoda. 1. slice the onions thinly and take them in a mixing bowl. also add chopped green chilies. if you do not have green chilies, then add red chili powder. you can also add chopped coriander leaves, if you want. 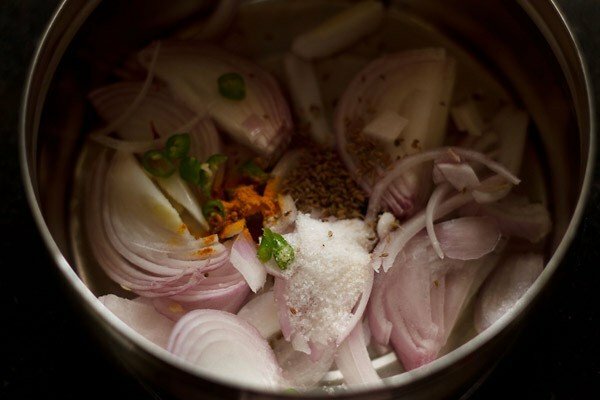 2. add the spices – carom seeds (ajwain), turmeric powder, asafoetida and salt as required. 3. mix everything well. cover and keep the onion, chilies and spice mixture aside for 15 to 20 minutes. 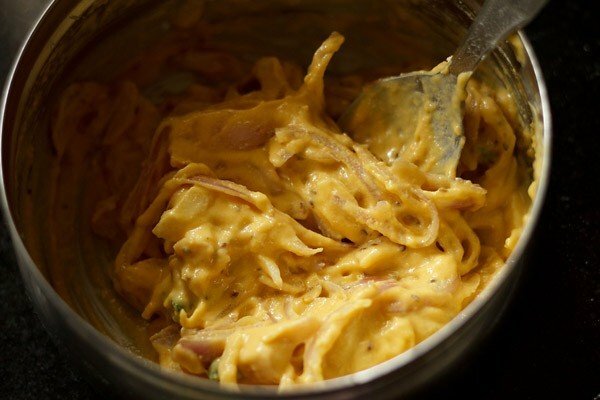 4. the onions would release water and then you can add water as required in the batter. 5. add gram flour (besan). 6. add required amount of water to make medium thick batter. 7. stir the whole mixture very well with a spoon or with your hands. the onion pakora batter is ready to be fried. you can either shallow fry or deep fry. 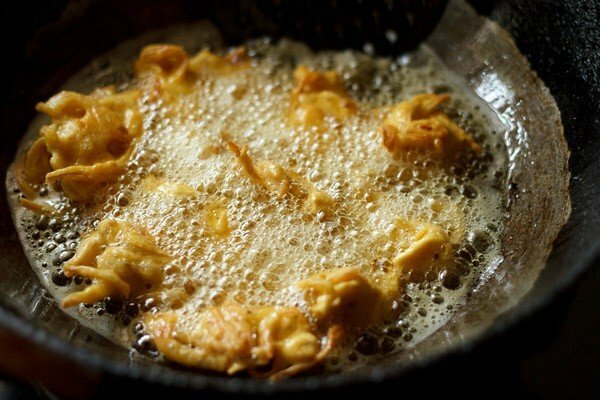 8. in hot oil, add spoonfuls of the onion pakora batter. 9. depending on the size of the kadai or pan, you can add less or more. just make sure you don’t overcrowd the onion pakoda while frying. 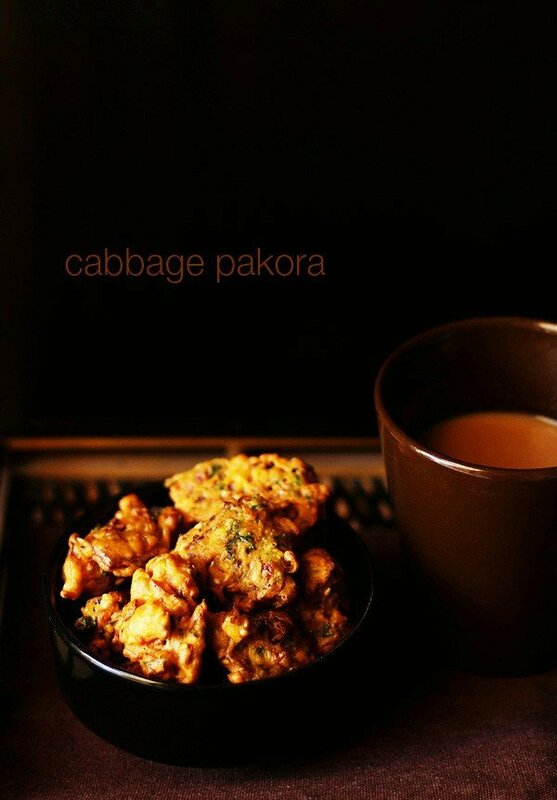 10. when the pakora are a bit cooked, turn over with a slotted spoon and continue to fry. 11. you will have to turn the pakora few times for even frying. 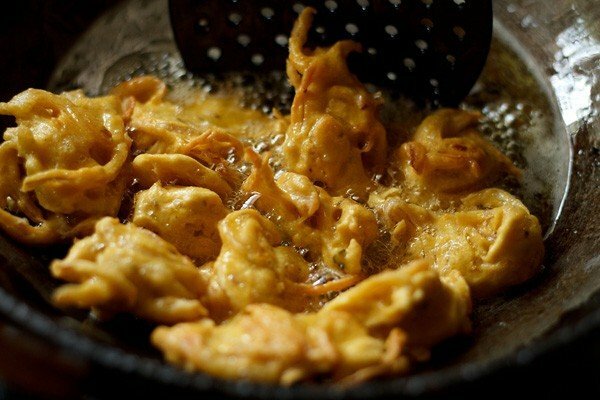 12. fry the onion pakoda, till they look crisp and golden. 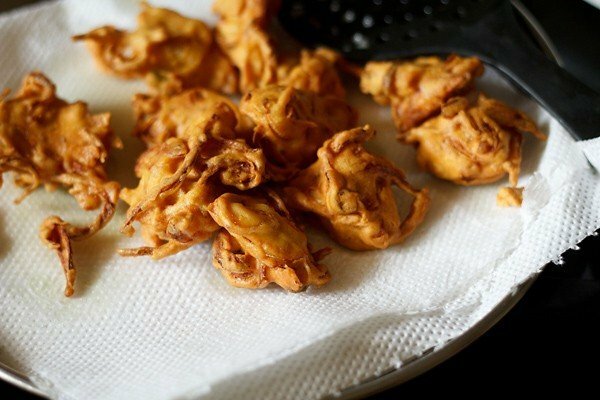 13. remove fried onion pakora with a slotted spoon and drain them on kitchen paper towels for excess oil to be absorbed. 14. in the same oil fry slit green chilies. 15. sprinkle some salt on the green chilies and mix well. 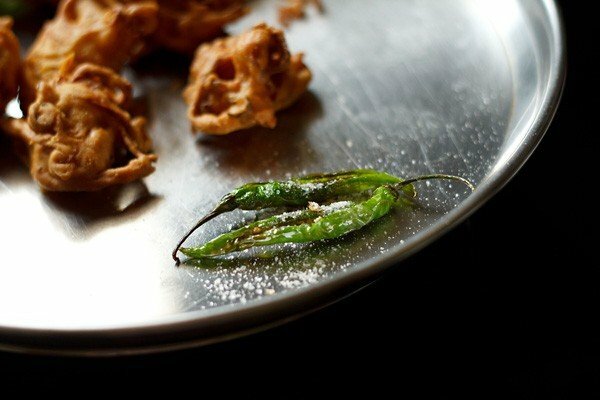 16. serve onion pakoda or kanda bhaji with the fried green chilies or coriander chutney or mint chutney or tomato sauce. It was sooo tasty . love it ! Gracias! After cooked, could they be frozen for storage? And re-heat in oven or microwave or sautee pan? gerard, onion pakora do not freeze well. at room temperature the crisp texture goes away, but they still taste good. you can reheat in oven and microwave. Hi Dasanna, Happy Holidays to you and your family. rom is any indian pakora recipe add 1 or 2 tbsp of rice flour along the gram flour which aids in making crispy fritters hope this helps’ you and thankyou. surely sushma do try recipes but do share your views on it 🙂 all the best thankyou and welcome. thanks vaishali for sharing positive feedback. glad to know this. Dassana – You are awesome! welcome sonam. glad to know this. thanks for your kind words and positive feedback. dassana, add some dried onion or fried onion to the batter nearly abt 5 to 10% of total batter. just feel the difference. thanks for the tip seema. will try this tip next time. I never realized you should use hing like that! You learn something new every day. I made these pakora’s just now (but I put the hing in the oil, as I didn’t see your response in time). They were delicious. May I also recommend a teaspoon of crushed fennel seeds? I love the aniseed flavour in combination with the sweet onions. Oh, I shallow fried them in the end, though next time I might try your baking method. On a side have you tried this batter on radishes? I wonder how shredded mooli would be? thats cool… the oil must have been fragrant with the aroma of the hing… yes crushed fennel seeds do add a lot of flavor & taste. sometimes even i add these to the pakoras. i have never ever tried the same batter with radishes. but i have made pakoras with shredded lauki aka bottle gourd – a kind of indian squash. you can also make pakoras with green bell pepper. aubergines slices, potato slices, bitter gourd/karela, shredded cabbage, cauliflower. mixed grated veggies and even bread. i guess they don’t make mooli pakoras in india as the mooli might lend it not so good aroma to the batter and eventually to the pakoras. so the result would be no one having the mooli pakoras. I see you advocate the use of hing in this recipe, since it is in the ingredients list, but you don’t show it’s use on the method. Can I assume, like always, that the hing is added to the oil when is hot, and just before you add the pakora’s? What is your feeling on deep frying? thanks gary for pointing out the error. i have forgotten to mention about hing in the post. will update the post. 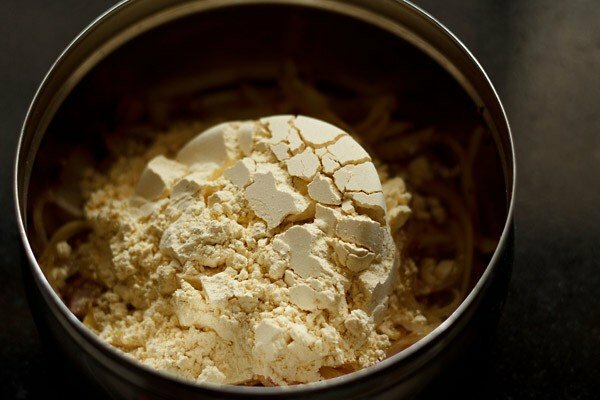 the hing is added to the batter and not to the oil. when we deep fry indian snacks, we never add hing to the oil. the hing is added to the batter or to the stuffing. 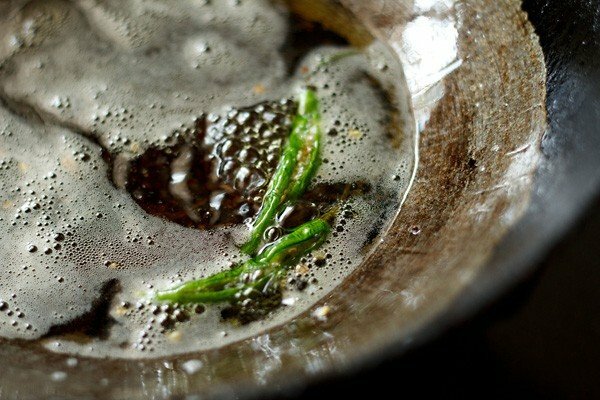 only when we make stir fried or sauted dishes or when tempering for dal etc, we add the hing to the oil. 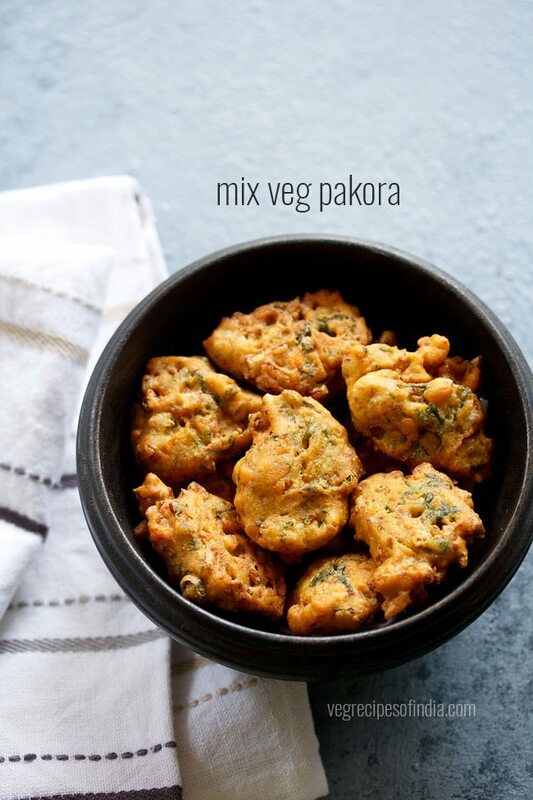 in pakoras i always add hing as they help in digestion since they are fried & also the chickpea flour can become heavy sometimes on the stomach.